The toxic pesticide Naled was sprayed by aircraft over Dorchester County, SC, to kill the mosquitoes that spread the Zika virus and over 2.5 million honeybees were killed at the same time. Beekeepers across the U.S. worry the same thing could happen to their bees if there is indiscriminate pesticide spraying in other states. Much of the U.S. food supply depends on the health of honeybees and other types of bees. highly toxic to bees exposed to direct treatment on blooming crops or weeds… To minimize hazard to bees, it is recommended that the product is not applied more than two hours after sunrise or two hours before sunset, limiting application to times when bees are least active. However, bees do not distinguish between Sunday morning or Tuesday, and they certainly don’t consider “between 6:30 and 8:30” to be “early morning.” Bees generally start their work day when the first rays of the sun crest the horizon. To truly provide protection for bees, aerial spraying must be done as soon after dark as it is safe to fly, before bees are out foraging. South Carolina officials claim that they had made efforts to notify beekeepers on their official lists, had placed a notice in the newspaper and had publicized the planned spraying on its website. Florida beekeepers are also familiar with the drill, as well as familiar with this particular pesticide. Naled is an equal-opportunity killer of winged insects. Says Key Largo beekeeper Dave Fowler, naled is readily recognized as an enemy by the bees themselves, as even a drop on a wing is fatal. When keepers know in advance of a planned pesticide dosing, they can take measures to protect their bees, including covering hives and protecting water sources. Still, smaller beekeepers can fall through the cracks. Allowing that a single hive of bees can house up to 60,000 individual bees, the term “small beekeeper” includes the one bee farm given so much coverage when this event first happened: Flowertown Bees, which alone lost 46 hives housing 2.5 million bees. Co-owner Juanita Stanley said that she usually gets forewarned when officials plan to spray but she got no warning this time. Beekeepers nationwide worry that this could happen to them if indiscriminate pesticide spraying is allowed. This is no small thing, and it not only affects managed bees. You don’t have to worry about bees right now. The bees affected by the millions weren’t wild bees; they were commercial bees, bred to produce honey. While it is true that recent reports in the mainstream media show a tendency to downplay the plight of the honeybee, many bee experts disagree that the crisis is either over or overblown. Furthermore, it is not only bees kept in hives that are being affected by indiscriminate pesticide spraying. It has been known since at least 2007 that 90 percent of wild bees have died out in the United States—though not solely from pesticide use.7 Bees in the wild are far from fine. According to one study that has been widely criticized for using “soft science” because—unable to actually count wild bees—the researchers used “a spatial habitat model, national land-cover data, and carefully quantified expert knowledge” to estimate whether and how far wild bee populations have fallen. Their conclusion: Wild bee populations have declined dramatically, and most prominently in many of the agricultural areas where bees are most needed.8 Blaming single-crop farming in addition to pesticide use, climate change, and disease, they suggest that numbers of wild pollinator bees have fallen drastically in 39 percent of farmland dedicated to pollinator-dependent crops. Specialty crops, such as pumpkins, blueberries, peaches, apples, and watermelons, are among the crops that present the strongest mismatch between changes in supply and demand. Want to eat California almonds? Almond crops depend entirely on honeybees. Billions of bees in the U.S. are shipped to the almond groves every February to pollinate those almond trees. Once the almond flowers have gone, there is nothing left for those bees to feed on and they have to be shipped to the next pollination site. Some 1,600 beekeepers earn a good part of their annual income not from honey sales, but from migrating with them to pollinate crops across the country. 1 LaMotte S. Zika Spraying Kills Millions of Honeybees. Sept. 2, 2016. 2 Guarino B. ‘Like it’s been nuked’: Millions of bees dead after South Carolina sprays for Zika mosquitoes. The Washington Post Sept. 1, 2016. 3 TRUMPET EC Insecticide. Sacramento-Yolo Mosquito & Vector Control District. 4 Yuhas A. US Beekeepers Fear for Livelihoods as Anti-Zika Toxin Kills 2.5m Bees. The Guardian Sept. 4, 2016. 5 Wadlow K. Keys Bees Suffer From Pesticide Used to Kill Zika Mosquitoes. Miami Herald Sept. 10, 2016. 6 Palus S. South Carolina’s Zika Prevention Backfires, Kills 2.5 Million Bees. Slate Sept. 2, 2016. 7 Gerber RT. 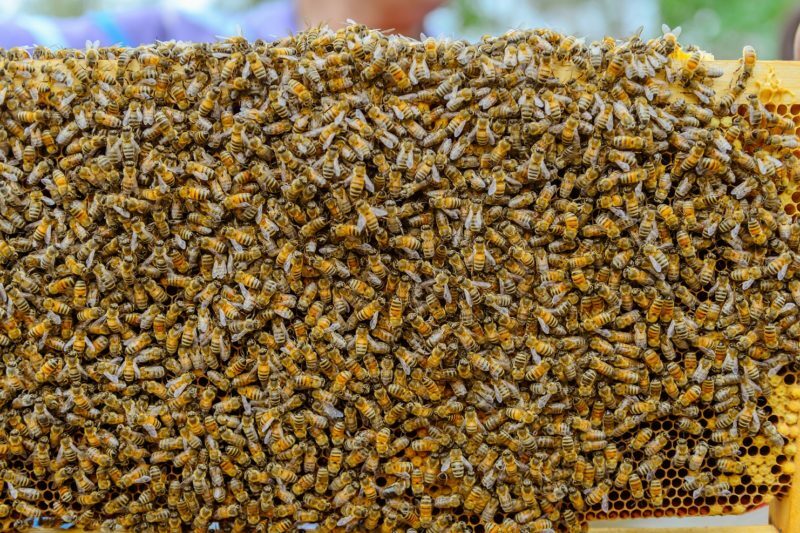 Mysterious, Massive Disappearance/Death of US Honey Bees–Colony Collapse Disorder (CCD). Target Global Health Mar. 23, 2007. 8 Koh I, et al. Modeling the status, trends, and impacts of wild bee abundance in the United States. PNAS Jan. 5. 2016. 9 Ramanujan K. Insect Pollinated Crops, Insect Pollinators and US Agriculture: Trend Analysis of Aggregate Data for the Period 1992–2009. Cornell Chronicle May 22, 2012. 10 Calderone N. Insect Pollinated Crops, Insect Pollinators and US Agriculture: Trend Analysis of Aggregate Data for the Period 1992–2009. PLOS One May 22, 2012. 11 Jabr F. The Mind-Boggling Math of Migratory Beekeeping. Scientific American Sept. 1, 2013. 12 Hagopian J. Death and Extinction of the Bees. Global Research Oct. 4, 2016. 4 Responses to "Naled Spraying in South Carolina to Combat Zika Kills Millions of Honeybees"
We’re all about protecting bees. It’s a major issue everyone should be aware of. We reject neonicitinoid of all form, and ask neighbors to do the same. We buy organic only produce to promote bee friendly farmers, every dollar spent matters for this issue. And we are careful to never be exposed to roundup or similar. (However xmas tree caught us off guard, did you know 98% of all xmas store trees are sprayed with roundup at OR farms and other places? We’re buying an organic tree next year regardless of cost.) We planted wild flower mixes to promote bee activity in a large portion of our yard, and sunflowers which brought in the amazing huge bumble bees. Plant your own bee friendly garden and do your part. People whom argue against bee safety are purely ignorant and a danger to society. It’s the honey that gifts a substantial portion of lasting natural immunity so we don’t need the vaccines! NVIC supporters should naturally be bee protectors and gmo free food proponents, the issues are inexorably intertwined. If the bees die, we may really at that point actually need vaccines because we won’t be able to sustain natural immunity without the existing range of fauna and food which bees make available to us. If gmo modification continues, the bees themselves will cause transmutagenic chain reactions as modified genomes sporadically manifest unintended alterations across a wide range of species while thee bees pollinate. To think they’re transporting bees on trucks is quite the shocker, given the transmutagenic argument. Bees don’t just pollinate one field, they go anywhere within miles. You all of this ends up in the honey. South Carolina might as well have gone to the grocery store and dumped Naled into honey jars directly in front of the customers. The nuked beekeeper should not only sue, but demand prohibition laws as well. I didn’t know the Zika Virus had reached SC!. I didn’t know it was such an emergency to spray! Now let’s get serious instead of sarcastic. Those officials who authorized the spraying and at such a critical time for the bees should be prosecuted. They obviously did not care. Even I, a 67 yo male, has known we have had a problem for years with bees dying with the most likely reason to date being pesticides. All right, now what do we do about it besides talk to each other? Can The Vaccine Reaction go on TV news? Bring a lawsuit? Does this organization have a Facebook page? (I don’t do Facebook, but it’s extremely influential, so we need it as an organization.) Emailing members and putting it online is not enough. How about action that will get us somewhere?